It is not enough to decide that a character, speech, episode, or television series is inspirational. To be inspirational, you have to have the ability to inspire. The speech ends or the character hits his big moment, and the viewer feels compelled to get up off the couch and do something, or be something. A better person, maybe. A more honest person, perhaps. A forgiving person? A perceptive person? A savvy political person? 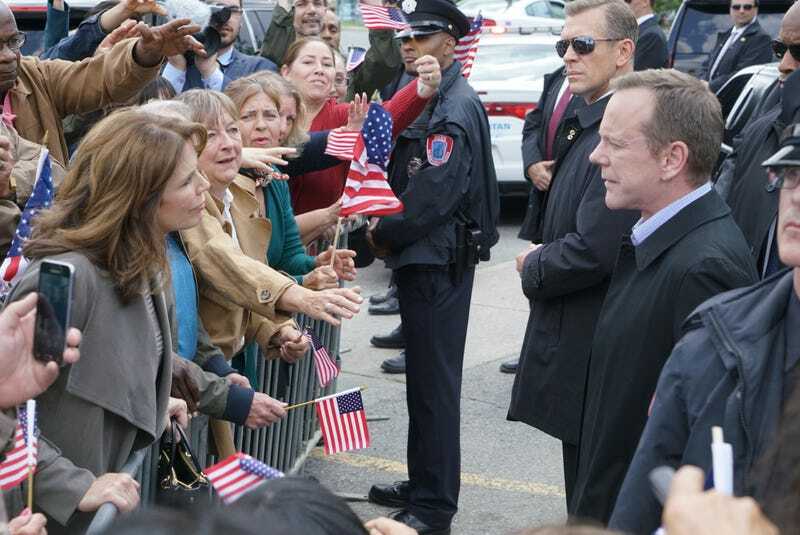 It’s totally unclear what Designated Survivor wants us to find inspiring, but it is obvious that President Kirkman’s actions in “Suckers” are supposed to be inspirational. He’s a man of the people who’s above petty political maneuvering, though conveniently his actions typically wind up being politically brilliant. He’s a man big enough to acknowledge his own flaws, especially when those flaws are ‘too honest’ and ‘cares too much.’ He’s not a regular President, he’s a cool President. “Suckers” is far from the worst hour of television ever created, but its attempts to sell us on Kirkman the paragon of virtue fall far short of the mark. That’s because five episodes into the show’s second season, the character’s still a generic good guy. There’s never any doubt that he’ll do the ‘right’ thing, or what Designated Survivor assumes the right thing to be, because his only consistent character trait is that bland, beige goodness. Whenever he strays from that, even briefly, the show becomes more interesting—for one example, the sight of watching Kirkman absolutely lose it on the Senator currently making his terrible job just a little more unbearable—but then those moments fade, and we’re left with President Good Guy. You can’t just cast Kiefer Sutherland and call it a day, Designated Survivor. There’s got to actually be a character there. As is often the case, this week’s A-story is bewilderingly thin and silly while, as always, managing to be needlessly convoluted at the same time. How does it do this? The mind boggles. The short version is that it’s basically ‘basket of deplorables,’ but much tamer and without a fundraiser. Kirkman gives the hard sell to a Republican Senator and friend, hoping to get his co-sponsorship for a relief bill that will directly affect million of people whose lives were affected by a Bernie Madoff-type who we never meet. In that conversation, he tells a joke that I listened to multiple times and still don’t really understand, and he calls the American people suckers. (Fair.) The Senator seizes on the opportunity to dunk on Kirkman and takes the remark out of context, using it in the course of a TV interview. As a result, Kirkman’s agenda suddenly loses all its steam, with everything from judicial appointments to the G-20 Summit to the aforementioned relief bill. Lyor thinks the only way to stop the bleeding is to go negative, and Kirkman won’t. One of the sharpest blows Kirkman takes during this no-good, very-bad press cycle comes from a victims’ advocate (Megan Gallagher), who confronts the President outside a staged event at a diner that everyone involved somehow thinks will solve the problem. At first, it seems that holding a baby and delivering one sick burn about someone’s chili might do the trick, but when the advocate throws Kirkman’s failure to act in his face in front of cameras, we’re back at square one. It’s a pity that one of the most interesting elements of the episode is relegated to its final moments, in which Kirkman sits down with the advocate and tells her he knows why she does what she does. Her husband was one of the men who perpetrated the scheme that’s tanked all these pension funds. He draws a line between what she does and what he’s doing—they’re both bound by obligation and duty, but also by a need to make right a wrong. Her husband defrauded millions of people, and Kirkman survived when almost no one else did. It’s compelling stuff, well-delivered by both Gallagher and Sutherland, and had any of this information been treated as character development, rather than a plot twist, the hour might have been a lot more interesting. Instead we spend nearly 40 minutes waiting for Kirkman to rhapsodize about the American dream in such a way that everyone falls in love with him again (and that speech, like the ‘suckers’ comment, doesn’t make a ton of sense.) It’s an inevitability, and nothing that happens along the way makes it feel even slightly less inevitable. Elsewhere, a British MP is murdered during her morning job, necessitating the reappearance of MI-6 Agent Rennett. He and Wells try to figure out who killed her, but they only get far enough to threaten a guy with shrimp cocktail, later shoot that guy in the neck, and make out in Hannah’s apartment. It’s not good stuff, but it does give Maggie Q the chance to pop off a few good punchlines and look extremely flustered about all the making out. The third storyline of the week concerns the ongoing investigation into Alex’s mother’s bribe, and Alex’s reluctance to trust the new White House Counsel. To be fair, having a parent placed in legal jeopardy might cause anyone to act irrationally, but Mrs. Kirkman’s behavior is again wildly inconsistent with anything we saw of her last season. That’s the trouble: when a series is uninterested in its characters, yet wants us to invest in their sometimes very serious and sometimes unrelentingly quirky lives, there’s a major disconnect. It’s possible that the First Lady could be a calm, collected professional one season and a temperamental loose cannon the next, provided that we see how the character got from A to B. It’s possible that Kirkman’s frustration could honestly tempt him to do things he believes to be morally or ethically wrong. But unless those choices and changes are a part of the story, it all comes to nothing. It’s just some swelling inspirational music, and the folks at home are sure to miss their cue. Sasha the live-streaming whiz (Jenny Raven) is absolutely right and Emily is totally wrong, by the way: if there really were suckers in the lobby, someone should have grabbed those things immediately. ...what? : They all thought the best way to stop “Suckergate” was to reveal someone was having an affair; Aaron is still the NSA; what exactly is Hannah’s job now? Italia Ricci did basically nothing but talk about candy and repeat herself this episode. Would someone get that poor woman a real storyline, please? Allison and Kate debate: Is free Coors Light good?